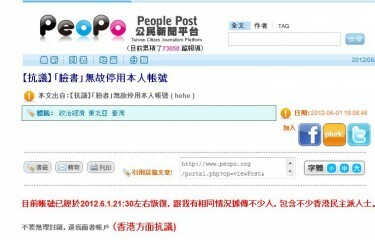 A Taiwanes activist posted an article protesting against Facebook's suspension of his account. On June 1st, Facebook suspended the accounts of several Hong Kong activists, causing speculation that the suspension was related to the 23rd anniversary of Tiananmen Protest in the absence of any other clear information or explanation from the company. Coincidentally, several Taiwanese activists and politicians also had their accounts suspended on the same day, which triggered Taiwanese users’ concern over the limitation on free speech. I couldn't find any link which provides explanation to the deactivation on Facebook. The information I've collected and the Facebook groups that I've created and maintained all disappeared, which has caused inconvenience to my work and interpersonal relationship. Ho told the Global Voices Advocacy that he complained to Facebook, but only got an email which was generated by the automatic replying system. He wrote again and claimed that he would take further action. The suspension was eventually lifted at 9 pm on June 1st. But till now, he hasn't received any apology or explanation from Facebook. A Taiwanese political Facebook fan page “Xien Ma Tong” （掀馬統）[zh] was also disabled and reactivated on the same day. The fan page was created to ridicule the Taiwan president Ma Ying-jeou. Another Facebook fan page “New Taiwan GoGoGO“[zh] which relates to a Taiwanese television station also reported that the messages could no be posted though the page was still being there on Facebook. Liu Jian-Kuo, a legislator from the Democratic Progress Party also said his Facebook account was suspended without any warning from Facebook. Taipei City Councilor Ho Zhi-Wei has written an official statement to Facebook, expressing his concern over Facebook's unreasonable account deactivation which has resulted in hindrance to free speech.